Welcome to the Aquadome – our tropical waterpark filled with watery fun and world-class experiences. Whiz down the fun water slides, ride the waves in the wave pool or sit back and savour life in one of the hot jacuzzis. The waterpark also offers wellness experiences and relaxation for both children and adults. Please note that your ticket to the Aquadome is only valid for entry once, and that during busy periods day visitors to the Aquadome may be required to wait. You are not permitted to bring your own food and drink into the Aquadome. The Aquadome features a good range of options where you can get something delicious to eat or a quick snack in stylish surroundings. Deli Express in the Aquadome offers pizza, burgers, sandwiches and more. Here children and adults can satisfy their hunger pangs and thirst before heading back to the waterpark. And why not try the many healthy options on the Deli Express menu? The Aquadome changing facilities are both child-friendly and functional. The armbands which you will receive on arrival are used both at the entrance to the Aquadome and to lock your locker. The changing rooms also contain changing facilities for the very youngest members of the family. Guests who fail to respect these rules may be asked to leave the Aquadome. The whole family can swim safely at the Lalandia Aquadome, although your visit is at your own risk – safety is always top of the agenda! Lalandia’s safety rules fulfil – and further build on – the guidelines issued by the Danish Council for Greater Water Safety in cooperation with the Danish Ministry of Justice, the Ministry of Health and Politimesterforeningen (the Association of Danish Police Constables). At the Lalandia Aquadome, there are always at least 3 professional lifeguards on duty to keep an eye on our happy bathing guests. All lifeguards receive continuous professional training. Each year, they must pass the professional lifeguard exam. In addition, they receive weekly training in resuscitation and first-aid, etc. Thus, our lifeguards meet all the current requirements so they are able to offer rapid, skilled and well-qualified rescue efforts in emergencies. No bathing equipment such as water wings and bathing rings are available in the Aquadome. You are welcome to bring your own or purchase them from the Aquadome Shop, where you can also get swim nappies and waterproof baby pants. If you have an Exclusive card, you get free admission to the Aquadome™ (NB: Saturdays, week 7, 27 - 32 and 42 access to the Aquadome is only permitted after 14.00), free admission to Monky Tonky Land and free admission to the ice rink. With an Exclusive card, you can look forward to lots of great experiences with family and friends. You can buy your Exclusive card in Sport & Bowling, where your card will be issued immediately. For enquiries and questions about group visits, please e-mail LB-event@lalandia.dk and we will get back to you as soon as we can. The red go-faster stripes say it all: Turbo Racer is a lightning-fast water slide for the very bravest water enthusiasts in the Aquadome. Look forward to a free fall experience and lots of speed. Feel the wild rush in your stomach as you hurtle down the tube at lightning speed before landing safely at the bottom – ready for another trip. The water slide features an impressive descent, which creates a fantastic free fall experience. Remember to check your speed on the speedometer. Which family member was the fastest? Are you ready for a thrill? 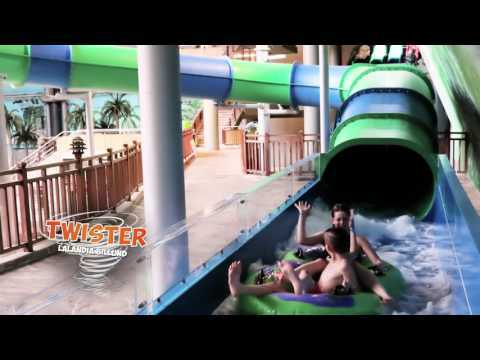 Try Twister – the wild, fun water slide that twists you round and round in a huge funnel, before you hurtle on towards the Aquadome. 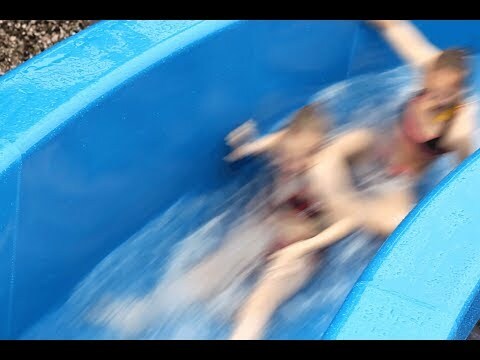 The perfect water slide for water-lovers with a need for speed!. Here, the whole family can take a trip down through the gigantic water slide, the Tornado, which starts high up in the Aquadome. Don’t miss out on this fantastic experience that is guaranteed to give you something to talk and laugh about. With up to 4 people at a time, there’s plenty of speed, thrills and action throughout the ride. Your journey starts and ends in the Aquadome, and en route Wild River winds out under the open sky all year round. Enjoy the popular outdoor area with lounge chairs and spa pool at the Aquadome. Here you can swim and play in the heated outdoor pool (open 1 April-5 November), or enjoy the warm water in the large spa pool, which is heated all year round. High up in the Aquadome you can challenge your family or friends to race at speed through the four parallel winding tubes. Who’ll be first? Time for relaxation. Hop in one of the rings, and take a trip in the gentle current around the waterpark. Enjoy a relaxing trip in the lovely warm water of Lazy River. Experience speed and turns aplenty in the Single Tube, which starts in the Tornado tower. Take the trip in pairs through the many fun twists and turns and enjoy the giant splash when you finally end up in the pool! The activity pool is a paradise of water activities. Shoot hoops in the basketball nets, do a balancing act on the water lilies or clamber up the huge climbing dolphins. The activity pool is very child-friendly. Colourful experiences await when you swim around in the secret cave pool. Dive down under the water and enjoy the beautiful sight of all the brightly coloured tropical fish frolicking in a huge underwater tank just a few centimetres away. Watch out for the waves in the wave pool. The water depth ranges from 0 to 160 cm, so it’s entirely up to you if you want to play in the big waves, or stay with the children in the gentle waves lapping against the beach in the Aquadome. 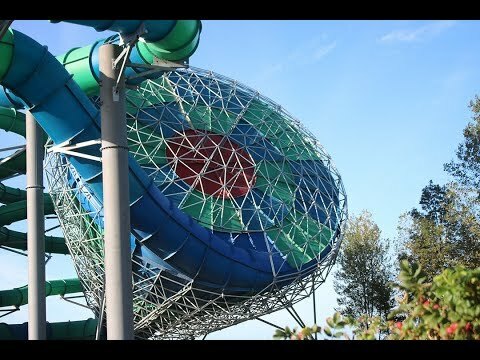 Our huge water playground with a myriad of fun challenges – water, water and more water. Hours of games and surprises with water guns, water fountains and small buckets that tip out everywhere. There is plenty of room and fun activities for the youngest members of the family in the Aquadome. Splash around, play with the fun aquatic animals, or take a ride on the small water slide. With a water depth of 60 cm and a water temperature of 28°, there are great experiences awaiting for the little ones. The children’s area offers five different smaller water slides between 5 and 10 metres long. Incline and speed are matched, so the youngest members of the family can have a fun experience. Relax in one of our jacuzzis or sit back and enjoy life in one of the lounge chairs by the indoor beach in the Aquadome. Let our sauna attendants spoil you when we organise a sauna session with essential oils. Wellness and pampering for the body. The temperature in the biosauna is about 60 degrees, enveloping the body with warmth in a pleasant and different way. A variety of oils and scents in the biosauna make your session a relaxing and de-stressing experience. Denmark’s largest sauna has space for 80 people in the hot, beneficial room that serves as a meeting place for friends, children, adults and grandparents who want to pamper their body a little. The sauna is located high up in the Aquadome with beautiful views out across the waterpark. Allow our trained sauna attendants to challenge and pamper your senses with a genuine aromatherapy sauna, where the aroma of essential oils and the heat from the sauna deliver an inner feeling of wellness, peace and wellbeing. Treat yourself to a relaxing session in the jacuzzi, and enjoy the beneficial massage provided by the bubbles. The water is a pleasant 38° warm. Pure wellness for body and soul. Half of this spa pool is located outdoors. Enjoy the snow during a winter holiday or the rays of the sun during a summer holiday while the tickling bubbles provide a light massage that has a de-stressing effect and promotes relaxation. Child-friendly, bright and practically equipped changing facilities with lots of space. We do not use keys, as the armband all guests receive on arrival also serves as a locker key. The changing rooms also contain changing facilities for the very youngest members of the family. Satisfy your hunger at the Aquadome – in the Food Court you can choose from Asian, Italian and American dishes. With three different cuisines, all the family can enjoy their favourite dish. The Pavilion in the Aquadome serves cold refreshments such as juice and water for the thirsty, while soft ice creams and ice cream are available if you want something filling.